Portable pressure washer units are those pressure washer machines that are often compact and designed to be easily carried or moved about when doing cleaning projects. One thing in common about these washers is that they are electric powered cold water washers and in most cases range between 1000psi and 1500psi. Some portable washers can also be 1600 psi and 2500 psi in output. Pressure washers of a portable design are usually suitable for home use and are most preferred by most home owners particularly senior as they are less demanding and are also easy to store. The following are some portable pressure washer machines some of which we also consider best electric pressure washers. This portable washer from Campbell Hausfeld has an output of 1800 psi and a water flow rate of 1.5GPM. 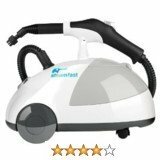 It can do most household cleaning projects with ease. Like so many other consumer portable washers, it comes with an auto stop system designed to protect the pump. This means spray gun trigger pulling is essential to get high pressure water coming out. You can also do your cleaning projects using detergent with this washer which comes with an attached detergent bottle. 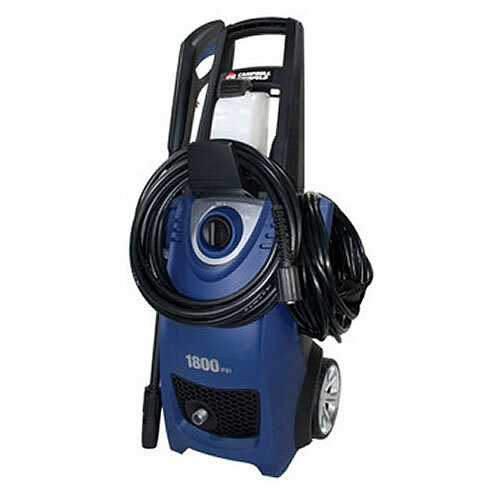 Unlike the gas powered 3000psi pressure washers or 4000 psi washers which have quick connect nozzles and can even work with an after purchase pressure washer turbo nozzle, this unit has an adjustable fan lance of 0 degrees and 60 degrees. Other specs of this unit include a power cord of 35 foot GFCI cord, a 20 foot high pressure hose and a two wheel cart with plastic wheels. 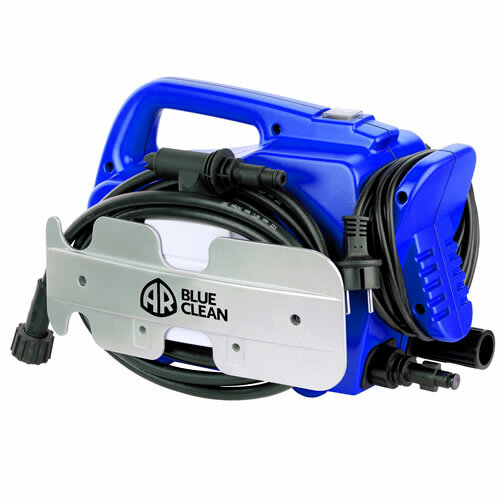 The hose is made from PVC/plastic material typical of most portable pressure washer models of this range. We highly recommend this washer as a great buy if you are looking for a portable machine to use around the home. It sells for only $130.00 online. You may follow link to read our other reviews on other Campbell Hausfeld pressure washers. This Karcher pressure washer has an output of 2000 psi. 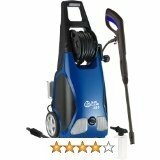 It is amongst the top rated pressure washers. In fact we consider this unit to be amongst best pressure washers in as much as it is a consumer class home owner type of pressure washer. It is suitable to do most jobs around the home. At 2000 psi and 1.4GPM you will achieve much with this cold washer pressure washer. Karcher is a respected brand in Europe and the United States. Their products are German engineered and have a reputation of durability great power output and easy to use requiring low maintenance. It has a 25 foot high pressure hose a 35 foot GFCI electric power cord. Other features that are unit to this unit compared to its competitors include an advanced technology reducing heat generated by pump and motor. This increases the longevity of the unit. It also has a vibration dampening system which limits wear and tear. 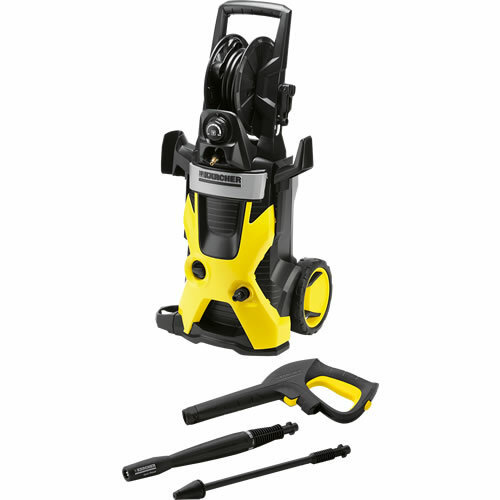 There are no quick connect tips for this portable pressure washer from Karcher. It has what is known as the vario spray wand a system similar to that found on the Campbell Hausfeld above were spray pattern can be adjusted. This is a highly rated model. It enjoys great industry wide respect and reputation even amongst owners and users. It has a carrying handle on top and two wheels for easy mobility. AR Blue Clean enjoys a very huge positive reputation in the North American market. This model AR118 has very good ratings and also enjoys positive reviews from many satisfied users. It is an electric cold water pressure washer with an output of 1500 psi at 1.5GPM in water flow. The unit comes with a 30 foot power cord and a 20 foot high pressure hose. the CONS have come from some users who bought the unit expecting greater output than is possible for this small unit. If you want to do quick jobs around the home that do not demand a lot of pressure, this is the unit to consider. We recommend this unit which sells for under a $100.00.